Easter is here in just a few days! In just a few days we proclaim, “He is risen!” (Mark 16:6) Who is risen? It’s Jesus! How do we know He is risen? Because the stone is rolled away and the tomb is empty and Jesus appeared to so many witnesses (1 Corinthians 15:6). Would you consider that perhaps the first witness to Jesus’ resurrection was the stone? The stone that was rolled in front of the tomb (Mark 16:46). The stone that was sealed with the Roman seal and guarded by Roman guards (Matthew 27:66). The stone that would be too heavy for the ladies to move who came Sunday morning to anoint His body with spices (Mark 16:3). But the stone had already been rolled away by an angel and an earthquake (Matthew 28:2)! The stone miraculously rolled away, leaving fainting guards and an empty tomb (Matthew 28:4-6)! If the stone could tell the story, what would it say? We wonder what Joshua’s stone thought when God’s people turned away from Him again and again and again? Did it witness to all the words of Moses and Joshua? Did it tell the people how far they had fallen from God? Did the stone show God how much His people needed a Savior? And when that Savior, God’s Son Jesus, came to walk this earth, He taught the people about stones. He said He could raise up children for Abraham from the stones (Luke 3:8), that if the people didn’t praise God, the very stones would cry out to worship Him (Luke 19:40), and that the Stone the builders rejected had become the Chief Cornerstone (Psalm 118:22). Yes, the stone that rolled away is a witness for us that Jesus, who died for our sins on the cross, was buried, and the third day rose to eternal life. The stone shouts, “The tomb is empty! Jesus is risen!” We must believe the stone moved and Jesus is alive, or our faith is in vain. Today’s TEA CUPP: Listen to the witness of the stone: Jesus is risen! Read one of the Gospel accounts (perhaps Matthew 28:1-10) of this greatest story ever, the true story of our Savior Jesus rising from the grave. Believe in Jesus. Thank Him for His saving work on the cross, His forgiveness, and His promise of eternal life in heaven. This spring I share with you video clips from an interview my pastor hosted for me last year. Today I offer a short clip entitled, “Ways YOU can PRAY for my ministry.” I share some of my current projects and how you can be praying for me to bear fruit for Jesus. I sure appreciate your prayers! How to Have TEA with Jesus. If you’d like me to come speak for your next ladies’ gathering or retreat, please contact me here. To view more of my interview please see Hello from Jennifer Grace, My Testimony, My Mission,One Life to Spend, and My Dream and His Promise. If you’d like me to come speak for your next ladies’ gathering or retreat, please contact me here. This month I share with you video clips from an interview my pastor hosted for me last year. Today I offer a short clip entitled, “His Promise.” Jesus promises us that He will come if we just open the door of our hearts to Him. To view more of my interview please see Hello from Jennifer Grace, My Testimony, My Mission,One Life to Spend, and My Dream. If you’d like me to come speak for your next ladies’ gathering or retreat, please contact me here. This month I share with you video clips from an interview my pastor did with me last year. Today I offer an excerpt from my book, My TEA CUPP Prayers, entitled Only One Life to Spend. 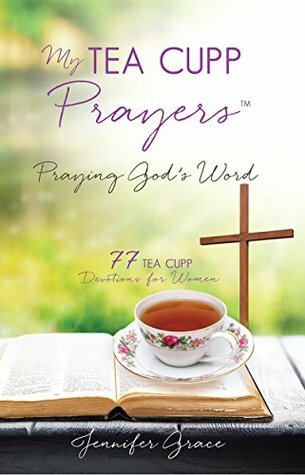 In Let’s Talk About Calling, I share even more about how God called me to this ministry to invite ladies to TEA with Jesus. To view more of my interview please see my Hello from Jennifer Grace post. If you’d like me to come speak for your next ladies’ gathering or retreat, please contact me here.